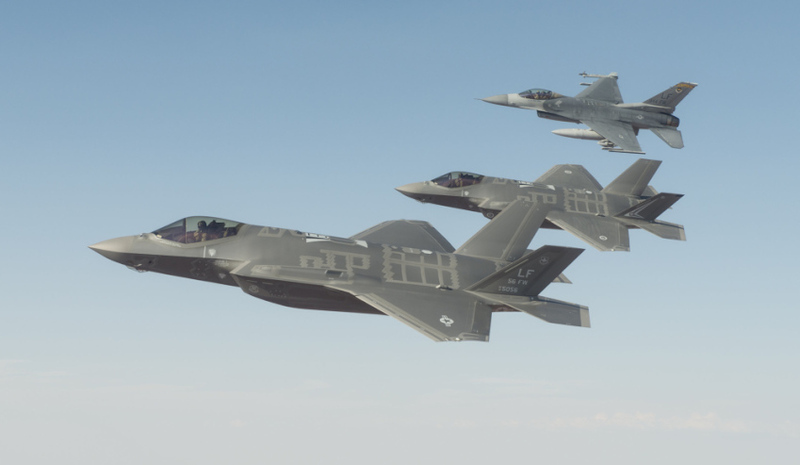 A Royal Australian Air Force F-35A flies in formation with a US Air Force F-35 and F-16 during trial flights from Luke Air Force Base in Phoenix Arizona. Pratt & Whitney, a division of United Technologies,. has announced the successful completion of performance testing of its Fuel Burn Reduction Demonstrator Engine, which could ultimately improve the Joint Strike Fighter (JSF) F-35. Based on the success of the testing, Pratt & Whitney can now offer a Growth Option 1.0 upgrade configuration for the F135 engine, which powers the fifth generation F-35 Lightning II fighter aircraft. The engine testing, conducted at Pratt & Whitney's West Palm Beach, Florida, facility, found that this upgrade can provide a 5-6 per cent fuel burn improvement and a 6-10 per cent thrust increase across the F-35 flight envelope. The aerospace manufacturer said, while the current production F135 engine meets today's performance requirements, an F135 propulsion upgrade would enable future capability improvements associated with the F-35 weapon system's block upgrade program. Pratt & Whitney has been working through the Navy-sponsored F135 Fuel Burn Reduction (FBR) and Air Force-sponsored Component and Engine Structural Assessment Research (CAESAR) technology maturation programs to develop a suite of compressor and turbine technologies, which can be used to enhance the performance of the F135 engine by decreasing fuel burn, increasing thrust and improving hot section durability. President of Pratt & Whitney Military Engines Matthew Bromberg said incorporating the improvements of the Growth Option 1.0 configuration into the F-35s would pose little risk to the program. "Based on the demonstrated improvements, we see a potential path forward with the Growth Option 1.0 configuration for the F135 engine that could benefit the global fleet of F-35s in the near-term at low technical risk and low cost, should the program desire an upgraded engine in the future," said Bromberg. "The performance benefits of increased thrust and reduced fuel burn will provide even greater capability with respect to combat mission radius, acceleration and sustained turn rate, as well as enable improvements in powered lift thrust." The Growth Option 1.0 configuration is compatible with all three variants of the F-35 and limits hardware changes for the upgrade to just the F135 power module (compressor, combustor, turbine). Pratt & Whitney also believes the Growth Option 1.0 hardware can be seamlessly inserted into future production engines with no impact to delivery schedule. "Pratt & Whitney has developed an affordable upgrade for the F135 engine that can be ready for follow on modernisation upgrades to the F-35 weapon system in the early 2020s," said Bromberg. "As we look to future warfighter needs, we believe the options for increased thrust and fuel burn reduction improvements will translate directly into mission effectiveness, and help to ensure the F-35 weapon system continues to go above and beyond any potential threat."